Here at "3 Wheeler World" we have strived to make this the Best and most informative 3 Wheeler site on the Internet!!! We have been ask so many times to put more information on the site. We have taken on the challenge! Here is Howdy's latest project: Magazine articles. To start things off we decided to scan and add all the covers of the old 3 wheeler magazines we have acquired thus far. Howdy's Goal: The goal is to scan each and every Magazine Cover to Cover and putting them on CD's. Not to mention adding lot's of articles to the site. This is a major project to say the least. With over 140 magazines in the collection so far and more coming. Scanning: Each magazine has a average of 110 pages each. Just with the magazines Howdy has now there will be over 15,000 pages scanned when done scanning. That is a a bunch of scanning!!! There is a little over 1000 pages are done so far. It's a big task but Howdy is working on it ( until the scanner burns up! lol). We are starting here: We are scanning the covers and posting them first. Howdy has Dirt Wheels®, 3Wheeling®, Crash & Burn® and many others. UPDATE 12/25/02: We now have 147 of these Old Magazines Covers scanned and added to the site, with more to come. So look for more magazine updates ( cover scans, articles and such ) in the future. Let's begin with the First Magazine that was devoted to 3 Wheelers. 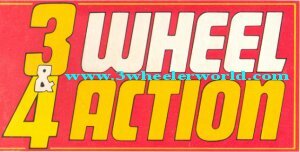 They did have articles on other ATV's also, but 3Wheeling® was the first "True 3 Wheeling Magazine". I base that Going by original first issue date. Sure other magazines had articles on 3 wheelers before How ever 3Wheeling® was the first to focus on 3 wheelers. Note: Click on the Magazine banners to see the covers of the magazines. I hope you enjoy these. I know I do. I will be adding more Magazine stuff in the future. Stay tuned to 3 Wheeler World for lots more information and pictures. We are working hard to stay "The Best" site on the Internet for 3 Wheelers! !